Read about the changes below and don’t hesitate to upgrade your Enterprise Alert instance soon! 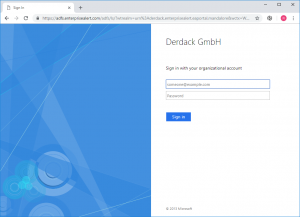 Enterprise Alert® 2019 does now support multi-tenancy, i.e. data from different departments or branches can be separated much better. This enables you to ensure that each department or branch or each of your “customers” can only see the data that affects them in system. However, multi-tenancy was designed for enterprise use, i.e. public hosting scenarios are not officially supported. The data segmentation does not take place on the database level, but rather on the application level. All data is still stored in the same database. The handling of multi-tenancy in the product is essentially based on a new entity, the so-called “tenant”. Global administrators can create and manage these tenants. The rest of the principle is quite simple and is essentially based on assigning almost* all other entities in Enterprise Alert® 2019 to one or more** tenants. The role model has been extended so that you can now create tenant-administrators. 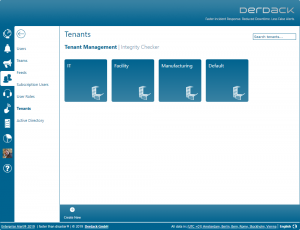 Members of this role cannot configure the system configuration (for example, the database connection), but can access all entities (for example, alarms) that belong to their tenant. The assignment of the entities in Enterprise Alert® 2019 (for example, an event source) to a tenant is done by the global system administrator in the Web Portal. When the product is updated to the new version 2019, your existing data is migrated and assigned to a default tenant. 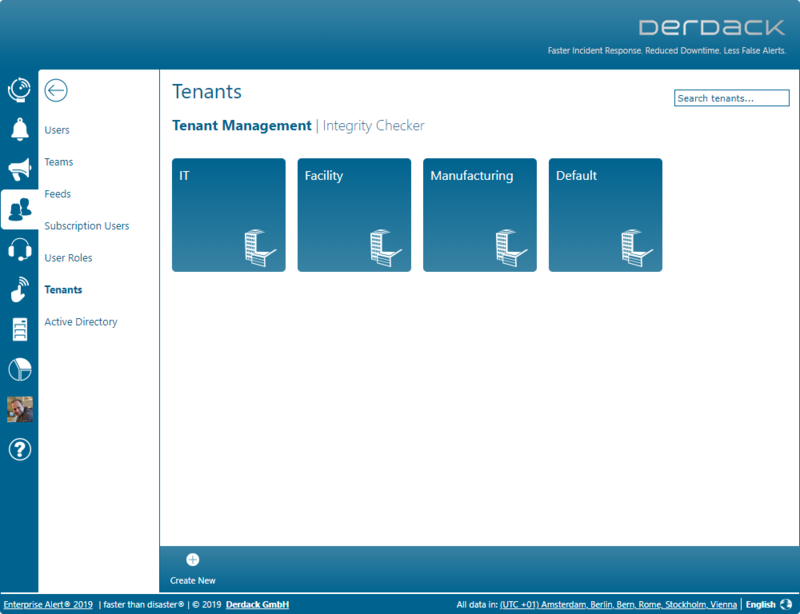 You can then create new tenants and start assigning corresponding entities from the default tenant to the new tenants. It is recommended that you use the “Integrity Checker”, a mechanism that shows you inconsistencies in your tenant assignments. An example of an inconsistency is the assignment of a user from a team to a tenant “A”, while the team itself was assigned to a tenant “B”. Multi-tenancy is an Add-On which needs to be licensed. It is however, included in the Enterprise Edition. Please contact Derdack sales if you are unsure whether this component is part of your license or not. The EnterpriseAlert Web Portal now supports both AD and SSO authentication via ADFS. 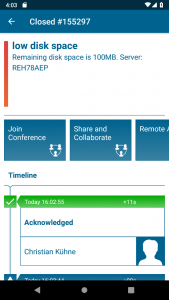 If you use multi-factor authentication with ADFS, this can now also be used by EnterpriseAlert users. The ADFS authentication is activated via the web.config file of the web portal, in which the correspondingly commented configuration blocks are simply commented in. In the mobile app, there is now a tile on the dashboard that can be used to turn receiving of alerts on or off. Users can deactivate alarm receiving for a select-able period of time, e.g. for holidays or other absences. After the set time has elapsed, the user is automatically reactivated for receiving alerts fro Enterprise Alert®. 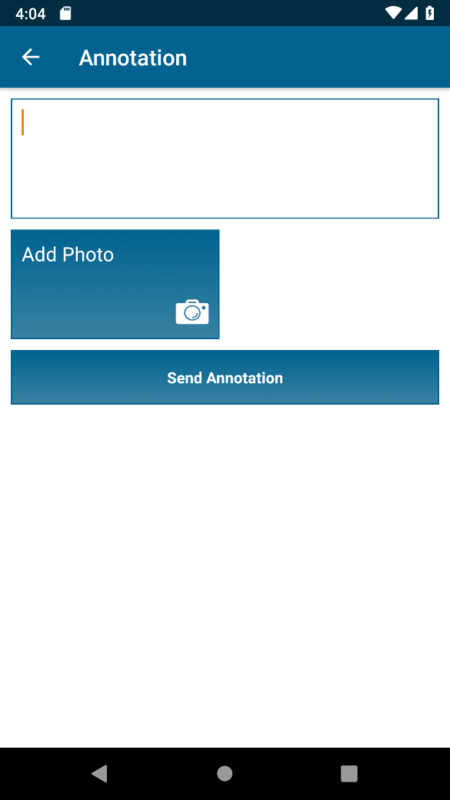 The Enterprise Alert® mobile app for Android now also provides support for commenting on alerts (annotations) and joining or initiating ad-hoc telephone conferences related to incidents. 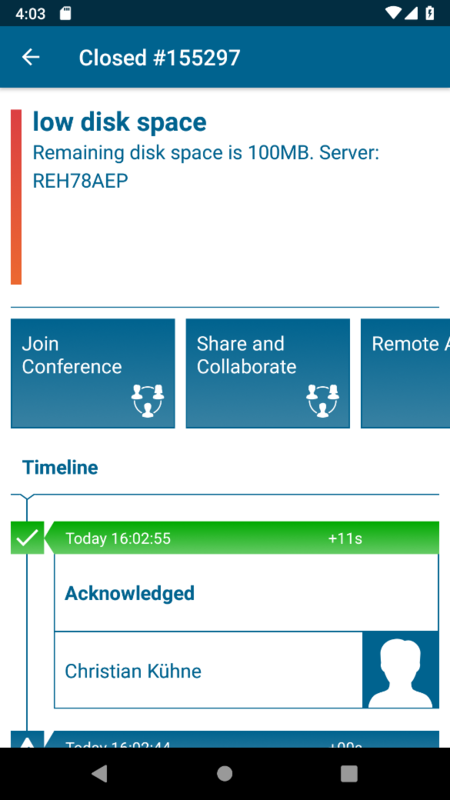 In addition, the Enterprise Alert® Android app now also supports “Android for Work”, i.e. you can configure the server URL in your MDM software, so that it does not have to be entered by your end-users themselves. Scripting Host script applications are now synchronized between Enterprise Alert® instances in a multi-server deployment. 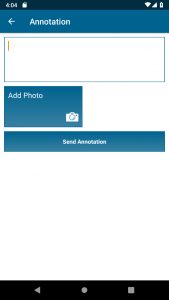 In previous versions, scripts needed to be manually replicated to all other Enterprise Alert® machines. This process is now automated which means, that you can now assume that your newly created script applications are available all all Enteprise Alert® nodes or that deleted scripts are removed from all nodes the same way. Enterprise Alert® 2019 now officially supports Windows Server 2019 and is built on the latest .NET Framework 4.7.2. The installation routine for new installations now ships with SQL Server 2017. The SystemCenter connectors in Enterprise Alert® 2019 were compiled for the latest SystemCenter product releases (release 1801). The setup routine of Enterprise Alert® 2019 provides an in-place upgrade for previous installations. The upgrade was tested for Enterise Alert® 2017 version 7.1.13. If you are currently running an older version it is recommended to patch to that version before upgrading to the Enterprise® Alert 2019. Before you start the upgrade by running the EA2019.exe file on your Enterprise Alert® machine(s), it is highly recommended that you backup all your Enteprise Alert® 2019 servers and that you backup the EnterpriseAlert database. You will otherwise be unbale to rollback should the in-place upgrade fail and disrupt your current installation. Testing the upgrade on a sandbox or staging environment before applying the upgrade on your production environment is highly recommended. Upgrades to Release 2019 will be free of charge for any customer under Derdack Update Assurance. If you do not have support or update assurance contract with Derdack, there are other commercial options available. Please, contact your supplier or Derdack for details. Please, note that the new Multi-Tenancy Add-On will be available as part of the ‘Enterprise/Platinum’ edition of Enterprise Alert. If you have not licensed this edition, multi-tenancy is available as an optional add-on for any other product edition (Open API, Emergency Callout, Data Center).